Bulb’s Neil Campbell took time out from the preparations for the launch his latest collaborative album On to speak to Bob Mulvey. 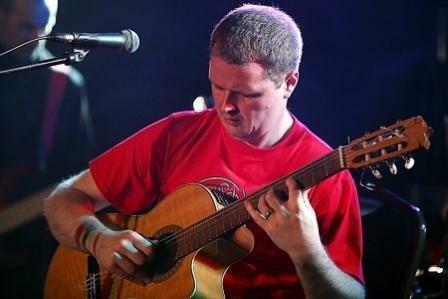 Writer, composer and guitarist Neil has produced a huge volume of work over the last fifteen years. To highlight just a few: two progressive albums under the Neil Campbell Collective (NCC), 3 O’Clock Sky and Particle Theory; a large scale multimedia project for rock band and choir entitled Frankenstein; a large-scale collaboration (Inventioning) with Jon Anderson; two solo albums Through The Looking Glass and Night Sketches; collaborative works with cellist Nicole Collarbone (Fall) and vocalist and composer Perri Alleyne-Hughes (Perri & Neil) and the latest foray – Bulbs, a post-rock concept band. Bob: Hi Neil – first of all thanks for taking time out from your busy schedule to talk to me. Bob: Before we kick off can I just say how much I’ve enjoyed this latest release which sees its launch this month. Can I ask how the preparations are going for the launch show? Bob: I’ve seen a number of filmed excerpts accompanying the tracks. Is this a visual taster of what the audience might expect at the show? Neil: We are working with an artist called Sonny Phillips who is producing visuals which synchronise with and help to illustrate the music – bringing out atmospheres and pulling in ideas for the audience to think about as they experience the show. We went through a process of discussing what the central concept is behind the album so we could allow the visuals to be created with a coherent focus. 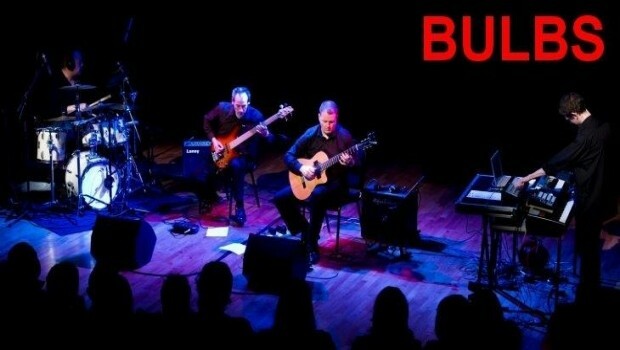 I can reveal the broad concept (for the first time) … As you will have heard the music moves from areas of calm and melancholy, with classical guitar and warmer electronic textures, to more aggressive passages with electric guitar and plenty of rhythmic dissonance coming from the bass and drums. We thought this was rather like the life journey of the fragile human spirit in a cold and alienating world of technology and politics. Throughout the visuals there is a central figure (almost a shadow or apparition) which we call Bulb Head that observes and reflects the environment being shown to the audience in the visuals. The visuals move from eye candy colours rather like abstract Fine Art, to atmospheric black and white found footage. Bob: On is a musical tour de force accompanied by social comment in the form of spoken word. Can I ask, was the music written beforehand and the commentary added later or did the two evolve together? Neil: I think samples and music were developed concurrently in a way. The idea of the band is to present the audience with challenging music and marry it with challenging concepts. The sound samples convey a literal narrative a little bit like lyrics do for songs. We liked the idea of almost creating mini movie scenes within tracks with our ‘soundtrack’ music giving the ideas even more atmosphere – creating a film soundtrack to the dystopian reality in which we live. At the start of us working together I developed a particular interest in ideas about the world that challenge accepted beliefs about aspects of the world – effectively conspiracy theories (which, whether you buy the theory or not, at least form their own interesting sort of science fiction). As we went on we started to throw in samples which supported the central notion that the world is a darker, perhaps more frightening and certainly more interesting place than is first apparent to the casual (TV) viewer and that people should open their eyes to the world in which they live…. Although the idea of switching on listeners like light bulbs as much applies to the music as to samples we use. I think we have used slightly less samples on our album than we have done or tend to do live. We have also been quite selective because we wanted to choose samples that would not date [because we want the album to have good shelf life] – we chose samples that for us communicated ‘timeless’ ideas or universal concepts. We may put other samples into our live sets which will reflect more specifically current subject matter. Bob: Tell us a little about your co-conspirators? 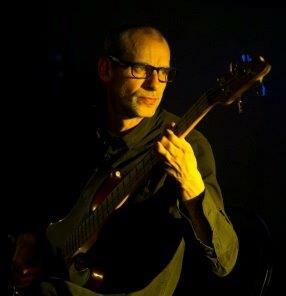 Neil: The band was formed with Andy Maslivec, the bass player with my former band The Neil Campbell Collective, and Joey Zeb, a session drummer who has a particular interest in progressive rock and dub and was part of a dub collective called The Zeb. He is also part of another progressive band in Liverpool called GORP. 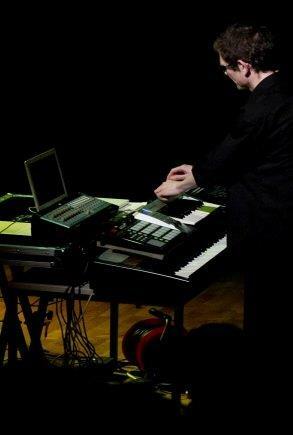 Marty Snape, the fourth member of the group, is a multi-instrumentalist who has a big interest in electronic music-making. He was also part of The Zeb and is in other bands such as Babadub and The Hat Band. Sonny Phillips is now our fifth member, with responsibility for visuals. He is a DJ and electronic musician with a background in Fine Art, and he was also part of The Zeb and is also in GORP. Liverpool is a small City, so artists with similar ideas and interests quite easily gravitate towards each other. Bob: So how did you guys all meet up? Neil: Andy was part of The Neil Campbell Collective from around 2008 (just after release of Particle Theory) and he worked with The Collective on the live project Frankenstein, which has yet to be recorded and released. I met Joey when we played together at some improv sessions in Liverpool together – he later also recorded some drums for the Perri and Neil album. 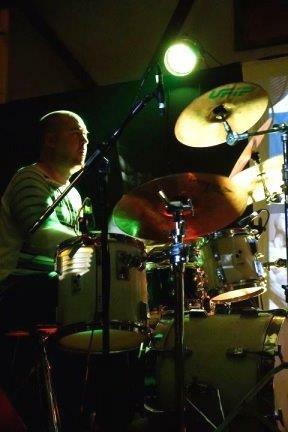 He is one of the best session drummers in Liverpool and has worked with countless bands. Marty was part of Zeb with Joey, and we initially got him in to record some demos of Bulbs because he was doing a little bit of recording work. The demos turned out well and we were very impressed with his conscientiousness – we asked him if he would be willing to play some keyboards and do live triggering of the sound samples in live shows (even though he is more of a bass guitarist / guitarist / drummer than he is a keyboard player). As we went on to record On he became a key part of the group, contributing a great deal to arrangement ideas and production and creating exciting electronic backdrops. Sonny was doing electronics for GORP and was a friend of the band, and because of his background and his sheer unbridled enthusiasm we asked him to join us producing visuals and also pulling in extra sonic ideas such as samples and noises into the live shows. Really the band is an amalgam of members of, and approaches from, two bands, The Neil Campbell Collective and The Zeb. Bob: I was mightily impressed with the rhythm section of Joey Zeb (drums) and Andy Maslivec (bass). The music is complex, but there’s a strong empathy and a musicality within the playing. Is this something that worked from the off, or did it evolve as the project went on? Neil: When we started the band, one of the first things the three of us wanted to explore was unusual metrically shifting and cyclical approaches to rhythm – that was a key objective. 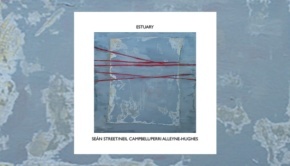 A couple of tracks from The Neil Campbell Collective started us off (517 and 3572) – both of these have passages where the bass/drums are in different time signatures to the guitars. Later in our repertoire, in tracks like Future Cities for instance, there are points where the bass is in say 5 and the drums and guitar are in 9. Something Joey does very well is make complex time signatures groove. This skill, added to the melodic angularity of Andy’s bass playing, gives a kind of groove with an edge – which gives a brilliant foundation to the music. From the moment we started playing together in a cold basement rehearsal space in the New Year of 2010, working our way through a couple of NCC tracks with some new ideas thrown, we knew instantly that it worked – it was a real blending of all of our styles and ideas into one ‘organism’. Bob: Perhaps less obvious is the role of Marty Snape who is credited with electronics. On the surface this may seem that his contribution is additional, although now it’s difficult to imagine the music without him. Was Marty part of the original concept? Neil: Marty is kind of the ‘Eno’ of our band. Most of the broad sway of the compositions (i.e. 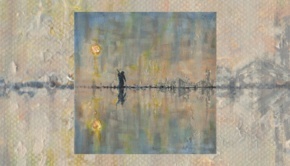 notes and rhythms) were there before he got started but then he took them into a new direction with his textures, and his attention to production and arrangement. Also, because he got involved with the music later on he was less inhibited or precious about making changes to arrangements, dropping instruments in and out to create contrasts and using the initial pieces as a springboard to create something more impressive than we could have achieved as the three-piece we started out to be. He has done an incredible amount of work on this record. The first is the main theme from the opening track (the ‘Lament’ melody) which recurs a number of times in different contexts. This melody was something I happened to be playing in rehearsal and Joey hit upon it and said ‘keep that’ (sometimes I just throw ideas out and it takes others to make selection of those, otherwise those ideas might be lost). We placed that Lament theme across the album into several of the pieces sometimes in surprising and semi-hidden ways. The second is a chord sequence which recurs in a number of the tracks which you hear in its cleanest form in the second section of ‘Illuminate’ but which is particularly audible in ‘Frankincensed’, ‘A Very Good Friday’ and ’USA’. The third is the idea of scalic almost baroque sequential movements in the guitar melodies and in the bass sometimes – like in the track ‘Majestic’ and which you can hear in the outro of ‘Lantra’. The fourth is the creation of multiple meters between the instruments where the band is simultaneously playing in different time signatures and moving in and out of phase. This is something that derives from African and Indian music but which I got into through Minimalist music. It happens notably in ‘3572 Off’, ‘Future Cities’, ‘USA’ and many other tracks. The fifth is a harmonic device called ‘gating’ in which chord progressions proceed through mediants or thirds (like C Minor to E Minor to G Minor for example) and create little gear shifts. You can hear this for instance in the long narration section in ‘They Control the Weather’ or in the long polyrhythmic section in ‘3572 Off’. The sixth is to do with stasis or drones and because of the guys enthusiasm for dub and because of the electronics (and what is idiomatic material for electronic sounds) there is a lot more time for space and drone across the album than in anything I have done before (before with the exception of some of my minimalist music). Throughout the album there is a continuous movement between cold and warm, between harsh textures and almost meditative ones so this creates the overall dramatic dynamic. When we create the music there is an attention to the groove and the atmosphere at the first level of the listeners’ attention and underneath that an almost classical approach to structure. Sometimes compositions have started life 80% formed or there may be just a bass line or a drum pattern to start with, around which we have built up the pieces together. The music is anti-ego, which means we are all pulling in ideas in service to the music – that’s why there are no rambling guitar or drum solos etc – every element from the drums to the electronics is composed with a sense of collectively understood musical logic. I like the idea of ‘totalism’, a sort of music that can touch the body, the heart and the mind in equal measure. 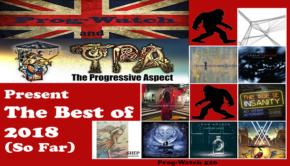 It is what we aim to do in our music and, in a way, I think the best Progressive Rock has the same multi-level effect on the audience. Bob: Fascinating. So… On is a complex and dense album – I can imagine this would be no mean feat to pull off live. But not content with this mammoth task, you are going to synchronise this with a film? Neil: Yes. We are quite used to playing it now and we plan to play it a lot more to promote the album. As I mentioned earlier, we use technology to help us achieve the synchronicity of the live music with the film and with the electronic aspects of the music. Bob: The whole project seems like an ideal candidate for a DVD. Might that be happening or something for the future perhaps? Neil: It is something we have spoken about. I like that idea but I also like the idea of keeping the visuals for our live performances as a component of them, to keep them special and exclusive– I’m torn. I think we are a band that is to be seen live. We want to have lots of elements – visual, conceptual and musical working together to create a very rich immersive experience for the audience. Maybe we’ll do a live DVD at some point which gives some impression of the whole live experience. Bob: On a more personal note, I hear a number of guitar influences across the On album, some of which I’ve not detected in your playing before? Neil: I have tried to reference at times specific players that I really like – Mike Oldfield, Robert Fripp and Steve Hackett in particular. I wonder if they were the players you were thinking of? Bob: Absolutely and all three are referenced in my review of the album. So can I ask – who were your early influences? And which guitarist might you be listening to now? Neil: I’m coming out of seventies Prog, krautrock, weird groups like Art of Noise, minimalist music like Philip Glass and Steve Reich and other more obscure composers and a fair bit of electronic music. I’ve built up my music collection now to going on for 2000 CDs so I am an avid music listener. 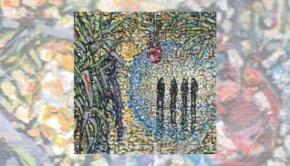 I am interested in composition really rather than guitar players per se, but I find it most interesting when there are player-composers with very distinctive styles – so probably the triumvirate of Oldfield, Fripp and Hackett are at the top of my guitar list, also adding in guitarist Pat Metheny who is also a big influence. I like the spirit of these musicians. Bob: Of the current crop of bands emerging, who, if any, have captured your interest? Neil: I am quite into Steven Wilson and some Porcupine Tree, and related things like some of Opeth’s output. I’m also into bands that straddle instrumental electronic music and rock such as Errors and Public Service Broadcasting. I like artists coming out the classical scene in downtown New York – people like Mark Mellits, whose work combines systems music with the energy of rock. Bob: On a lighter note Neil, what might we find you listening to in your leisure time? Neil: The last five albums I bought were Steven Wilson’s new Raven record, Max Richter’s recomposition of Vivaldi’s Four Seasons, Brian Eno’s Lux, Sunken Condos by Donald Fagen and Magma’s Ëmëhntëhtt-Ré – pretty random eh! Bob: An eclectic mix indeed. Neil many thanks for speaking to me and wish you every success with the album launch.